Paramount Pictures continues to pump out teasing clips for Star Trek Beyond and today, the latest in that line of marketing promos turn the attention to Sofia Boutella’s amicable alien, Jaylah. Lending a helping hand to Simon Pegg’s Scotty – Pegg enjoyed a much more involved role in Beyond, but more on that later – Boutella’s potential ally has an understanding of Krall, the menacing villain brought to life by Luther star Idris Elba. Taking umbrage with the Federation and everything they represent, it is Krall’s fleet of alien ships that can be seen piercing the hull of the revamped Enterprise in those eye-popping trailers, sending our crew careering toward his ominous planet without a paddle. Cast astray in pockets of two or three, Star Trek Beyond will then begin testing the relationships of its core cast, with Pegg and Boutella being the pair featured in the clip above. Justin Lin of Fast and Furious fame takes point at the helm, directing a cast that also boasts Karl Urban, Zachary Quinto, Chris Pine, Zoe Saldana, the late Anton Yelchin and John Cho. Meanwhile, Idris Elba, Sofia Boutella, Lydia Wilson, Shohreh Aghdashloo and Joe Taslim headline the flock of newcomers. As we mentioned before, Simon Pegg holds a writing credit on Star Trek Beyond, after both he and Doug Jung overhauled the threequel’s script once Roberto Orci departed, placing Beyond firmly on course to align with the franchise’s 50th anniversary. Star Trek Beyond is booked in for theatrical release on July 22. 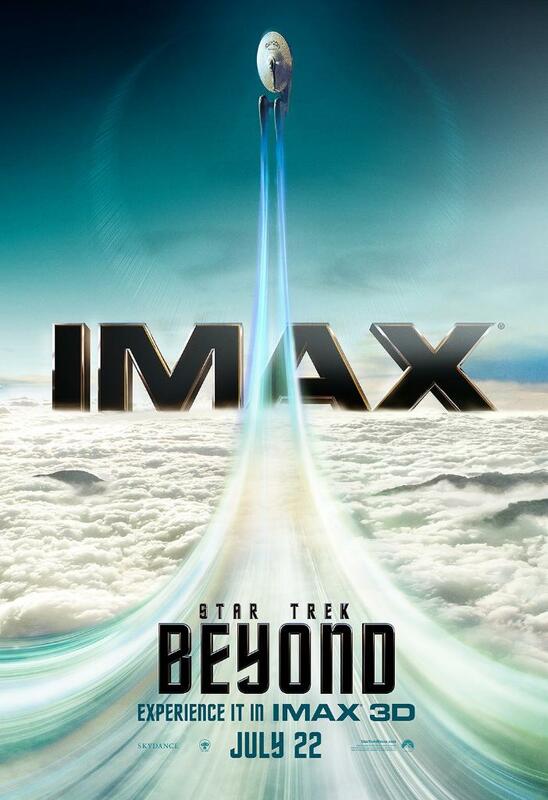 Yesterday brought forth the movie’s awe-inspiring IMAX poster, which you can see in full below.